One pan dinner that brings together flavor and nutrition. Place iced water and vinegar in a large bowl. Swish chicken pieces around in vinegar water to wash then pat dry. Arrange chicken (skin side up) on a baking sheet and sprinkle with salt & pepper. 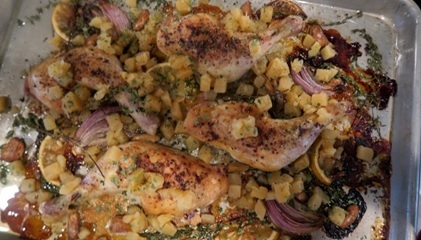 Place onions, garlic and thyme around chicken and drizzle allwith olive oil. Rub lemon with olive oil and place on baking sheet. Bake for 30 minutes then scatter rutabaga over the chicken andsprinkle everything on sheet pan with paprika and dried parsley. Continue to bake an additional 20 minutes until juices from chicken run clear when pierced (meat thermometer should read 160 degrees F).